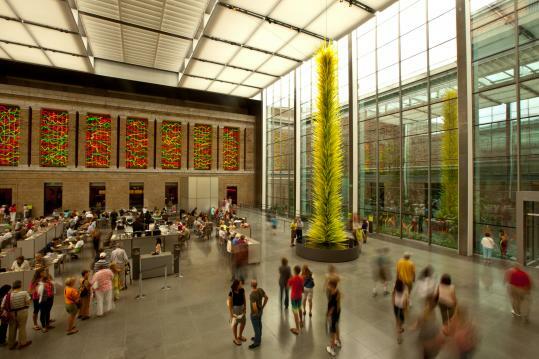 Dale Chihuly’s 42-foot-tall “Lime Green Icicle Tower’’ is here to stay. The Museum of Fine Arts announced yesterday that it has raised the more than $1 million needed to buy the piece, which will remain in the MFA’s Shapiro Family Courtyard. The piece was part of the recent blockbuster exhibit featuring the Seattle-based glass artist’s work. In July, the MFA told museum visitors that if they wanted Boston to keep the piece, they would have to pay up. The public responded, with more than 1,000 people sending in cash or stuffing bills into a box near the sculpture. In fact, $760,000 contributed to buy “Lime Green Icicle Tower’’ came from donors who are not trustees or overseers of the MFA. There were some larger donations, the biggest from a foundation belonging to real estate developed Donald Saunders and his ex-wife, actress Liv Ullmann.